We live in the sweetest little city in Texas! The population is booming though and progress is everywhere. By progress, you know that means building on every inch of space at the expense of nature. Monarch Butterfly Initiative. 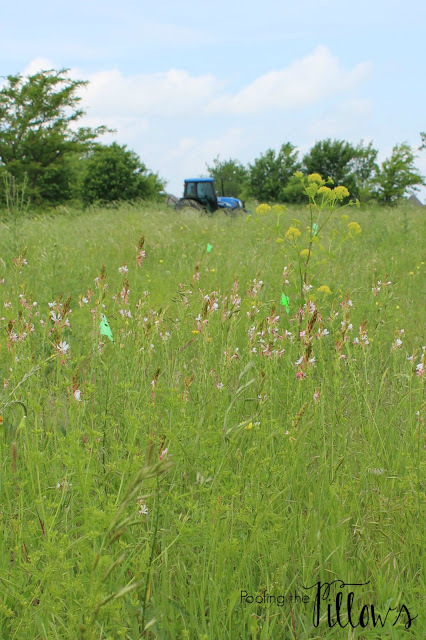 This is a conservation effort to provide milkweed and other beneficial plants for the butterflies in their migration route. Education is a big part of the initiative. I feel so lucky to be part of the group working on this effort in our city. 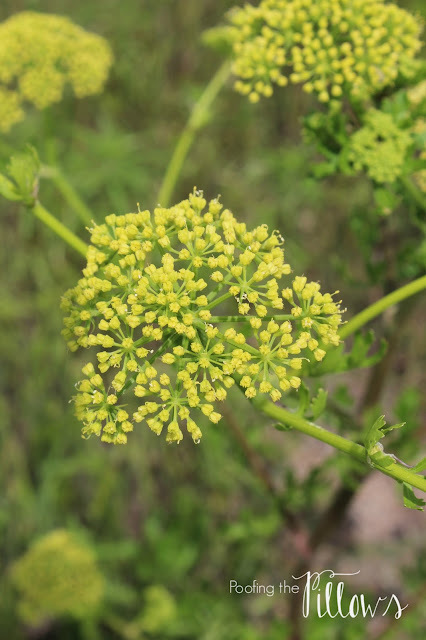 Parks have been established around town where wildflowers specifically chosen for butterflies and other pollinators are growing without being mown. Yesterday a friend and I went out to look for Monarch eggs and this happened!! Monarch butterfly on native milkweed. Sometimes you just have to take a moment in time as a sign that things are right in the world and this was one of those moments...a moment of confirmation and thankfulness for things in nature. I've learned so much in a very short time of involvement with this effort. We can do so much to help the earth by caring for the smallest creatures like butterflies and bees. We have to stop using pesticides. 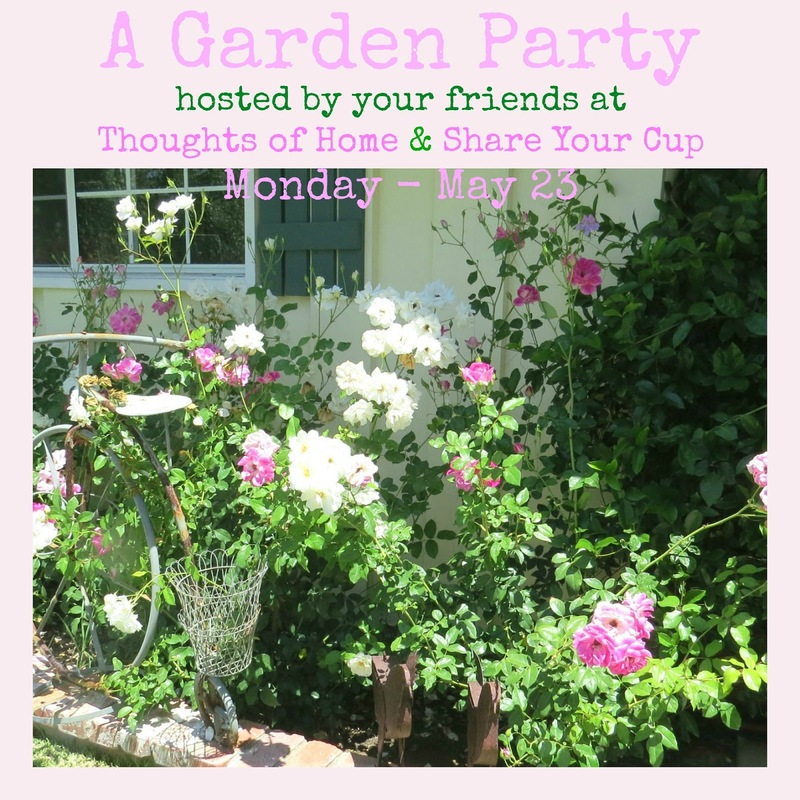 The second round of the garden party with Thoughts of Home and Share Your Cup is coming soon. Please mark your calendars and join us. We love having you! Stacey, this is so cute and the initiative is such a great lovely act to help Mother Nature. I am so grateful to those who take the initiative to preserve the beauty and treasures of nature! I have loved butterflies since I was a girl, they really make you stop and be still to observe their beauty. You got the best photos!!! 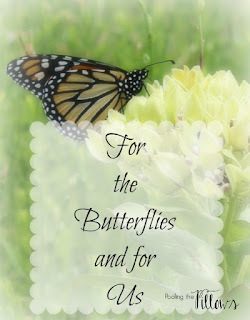 I love this concern for the precious Butterflies and your photos of support are wonderful! Butterflies bring such such joy and beauty. Thanks for sharing and linking this passion. Wonderful post. I so agree about pesticides. I know we want the controlled look, but there has to be a happy medium to take care of the planet that we are so blessed to live on. Lucky for me, I love the same plants that butterflies do! I was just looking at an empty spot yesterday. I feel a trip to the nursery coming on.... Great post. I am glad that your little Texas town is on board with protecting the environment. Good for you! It's so satisfying to help protect the environment. What a great thing your town is doing, Stacey...I'm in full support! Your photos are breathtaking! I love watching a butterfly flutter by in our yard. It is just a precious moment to enjoy a simple little thing. And I am so happy to hear that measures are being taken to preserve the butterflies down your way. Your images are just lovely. Thank you for sharing with us. I love butterflies, aren't they just the most ethereal creatures? I haven't spotted any here yet, but they are coming! I agree, we are overusing pesticides and so many other chemicals. They don't just affect the bugs we want to get rid of they affect everything, including us! I'm so very grateful to those who devote themselves to preserve Nature, that's the most precious gift we have and to take care of it is a duty of ours ! Thank you for this so inspiring post, my dearest Stacey, I've enjoyed it so much ! I'm glad you're part of this. Yes, we MUST stop using pesticides! This is why I hate big lawns. Then people fertilize them and use chemicals to rid the lawn of weeds, and there it goes into the water sources. I love nature, and I want to do my part to make sure it stays around without unnecessary harm to the beauties of nature. I am so curious what Monarch eggs look like. I will have to google it. Thanks for the informative post. I am going to share your post with our Garden Club members. I am learning so much about what you shared. Looking forward to the garden party. A great thing to for the butterflies...so glad they are making a comeback...Nature means nothing when it comes to progress as they say! What a wonderful way to help the precious butterflies. I love when towns take the initiative and do things like this. Makes you want to be a part of it and help out the wildlife. Good for you! Love how your town is helping out and protecting the butterflies. Lovely post and photos. So glad to see more communities and public parks helping the butterflies. 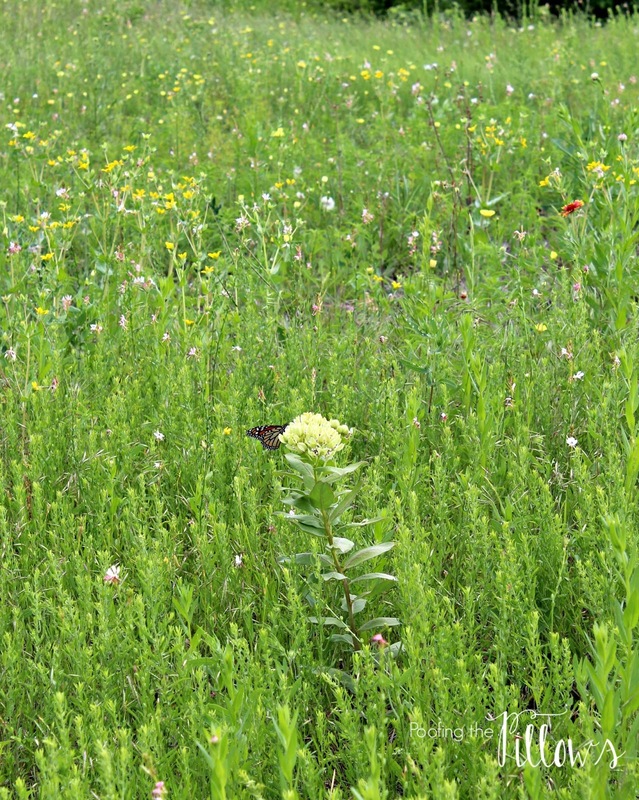 I've started my own little butterfly garden on the greenbelt behind our house...last year I had my first Monarch babies! This year I've planted more milkweed and hope to see even more butterflies. Great post! I think more and more people are becoming butterfly aware. 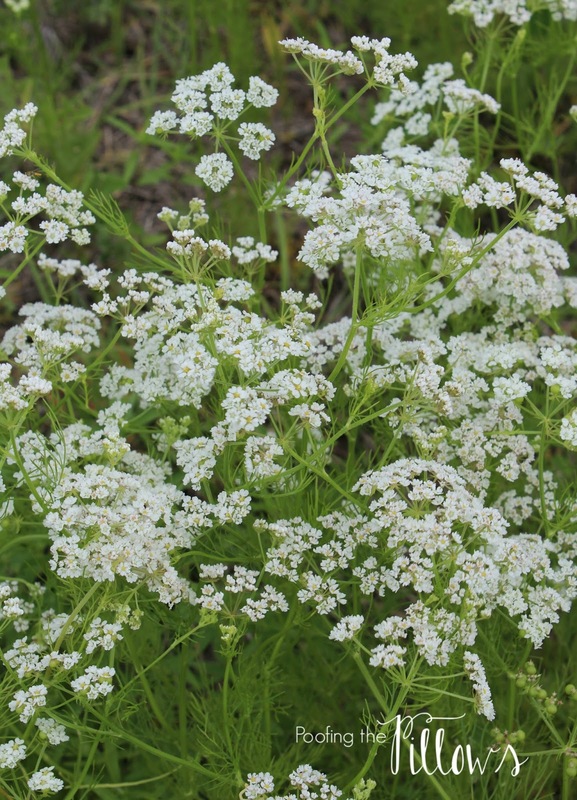 It is so easy to just focus on what is happening in our own yards (sometimes guilty of this). You are a trailblazer Stacey! I am now going to research butterflies in my area. You have some wonderful photos of wildflowers and butterflies. You know that I fully support not using chemicals in our yards. The more we can spread the word, the more success we will have in changing people's choices. A couple of days ago I not only saw butterflies in the yard, I saw a dragonfly on the agapanthus blooms on the deck. This a beautiful way to help the Monarch as it migrates south. Not only does this help the butterfly, it helps us. Who doesn't feel better after passing a field of wildflowers. My sister traveled to Mexico City to see the Monarch. Seeing thousands of butterflies was a lasting impression and helping them along the way is a wonderful thing. Thank you for such an informative post. 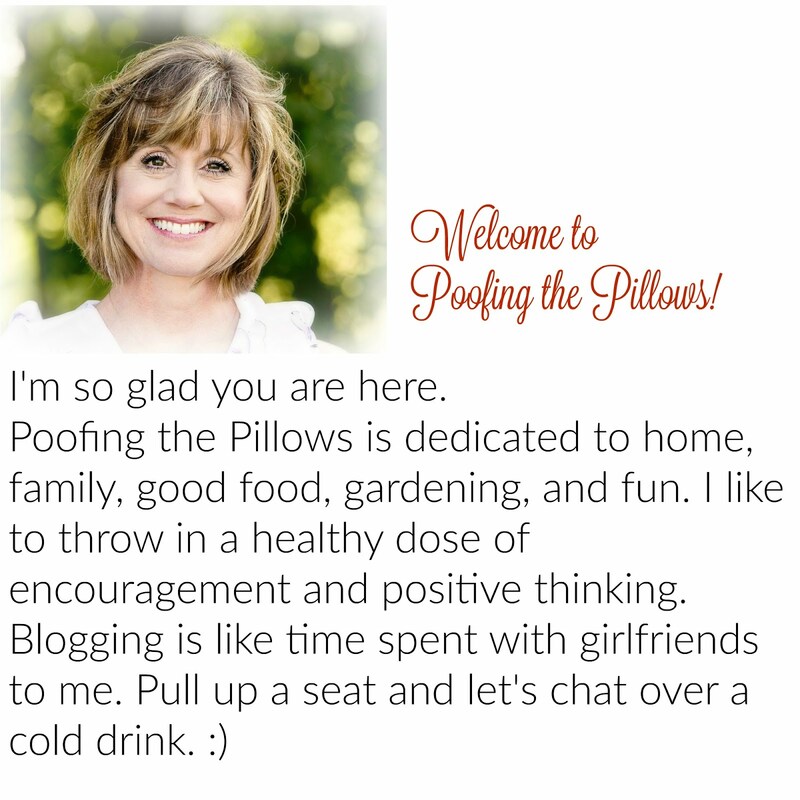 I will be adding your new Garden Party button to my sidebar. This is so great Stacey. Butterflies are such a vital part of our existence. So happy you in in a town that wants to help keep the conservation going for these beautiful creatures. Your pictures are stunning. That's exciting that your town is taking part in that! When my son was in kindergarten (eons ago, it seems), our favorite lesson was on Monarch butterflies. They hatched them out and watched them as they grew and then became butterflies. Release day was fun. We are in the process of establishing beehives so keeping wildflowers available at the farm is a big priority. Perfect timing on your post. I'm going to go check out the links! We have a gove of trees here in Santa Cruz where the Menaces come and stay and it is a beauty to behold. All the local schools take field trips there too. Great job! What a wonderful town to make an initiative to save these amazing creatures!!! You took beautiful pictures too :). I've never heard of this type of conservation before. It's wonderful that your state is participating in this effort. I would hate to see butterflies disappear! Loved reading this post! I am the president of our local garden club and I am big into butterfly gardening. We are trying to introduce more of it into our neighborhood. Gorgeous photos. What a wonderful cause Stacey! 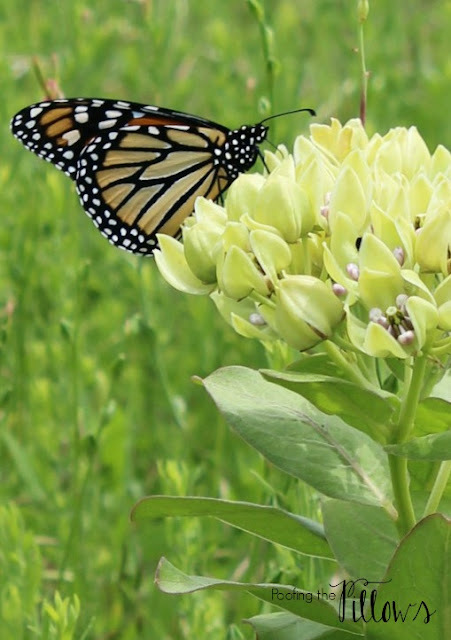 We have been encouraged to plant milkweed in our gardens for the Monarchs. I haven't yet, but plan to. We can not lose those gorgeous butterflies! Thanks for sharing with SYC. What a really neat project to be involved in. Now you have me wondering what the eggs look like and how small they must be! Oh my, isn't this just the sweetest of the sweet! Already you are attracting the monarchs! Love that you have found such a wonderful project to put all of your love and goodness into! What a neat initiative this is! 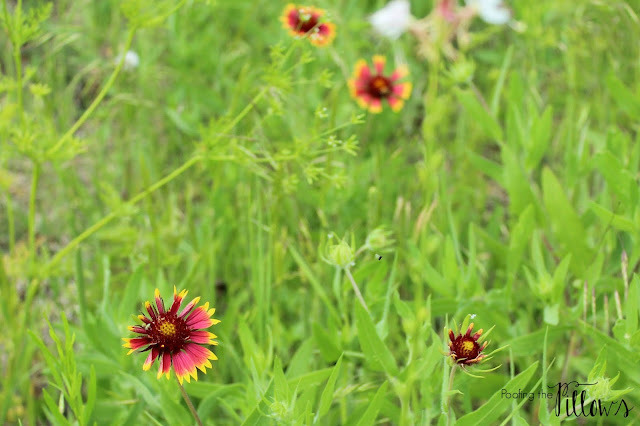 We live on 4 acres and we have a 'wildish' area that we have let grow up with native plantings and wild grapevine, etc...the birds and wildlife love it! I also grow butterfly bushes around the house - we love to see the butterflies on them all summer! It is the same here. I am sad to see all the land along Colorado's Front Range being gobbled up by developers. It is hard to stop" progress" but I'm glad to hear that cities are taking initiatives to help the butterflies survive and flourish. I love that there are people out there who are knowledgeable in these things and get things done for our sometimes defenseless creatures in nature. How wonderful that you are part of it. The pictures are just beautiful. Stacey, What an informative post. The photo of the monarch is just wonderful. Thanks for sharing. Sylvia D.